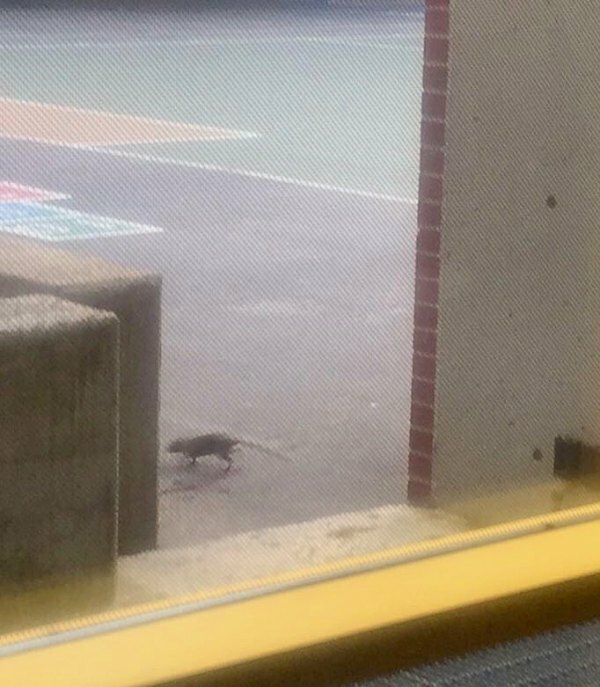 Rat from PS/IS 217's colony photographed romping in the School's Playground where children could be seen playing and sitting the next morning. When the City Departments of Education and Health and Mental Hygiene were finally crowbarred into visiting Roosevelt Island with PS/IS 217's thriving rat colony as subject, the rats came out winners as did school Principal Mandana Beckman. The rest of the community, especially the children exposed daily to dozens of rats, got nothing. Check that, worse than nothing. Being shown that you're powerless as a New Yorker and Roosevelt Island resident in the face of a deeply entrenched, do-nothing bureaucracy and ineffective elected officials. Since early in April, when Frank Farance brought on the wrath of his Common Council colleagues as well others in the Roosevelt Island Parents' Network by posting photos and commentary on the school's burgeoning rat colony, PS/IS 217 continued nurturing its rats until RIOC became the first and, so far, only government entity to take effective action. The infestation and the school's indifference finally brought RIOC President/CEO Susan Rosenthal and staff to meet with Beckman. At the same time, RIOC Public Safety Director Jack McManus tackled a related problem with school personnel adding additional dangers to children and neighbors by parking illegally in the emergency apparatus lane - fire lane - between PS/IS 217, the Roosevelt Island Day Nursery and Manhattan Park - with permission slips signed by Beckman. Ticketing the cars partially cleared the lane, although free parking cars are still being allowed to jut out into the fire lane. And the rats are doing fine as bureaucrats rushed to join the PTA and the Main Street WIRE in giving cover to the school's principal and extended life to her rat collection. Awakened also was City Council Member Ben Kallos. Kallos's efforts did little more, in the end, than demonstrate how powerless elected officials are in the face of the entrenched City bureaucracy, one filled with people for whom we never voted and who seem unconcerned about anything more than covering each other's behinds. It took nearly a month, the period required to double the size of a rat colony, for a contingent of DOHMH and DOE officials to make their way to the school for what was billed as an inspection. For the record, no actual inspection occurred, just what one observer called a "white wash," a show up designed to create the appearance of action being taken. In the meantime, the rat colony exploded, as documented in numerous photos here and on the Roosevelt Islander blog, aided by PS/IS 217's continuing its practice of tossing garbage into the open, frequently leaving it out to be consumed by rodents overnight and on weekends. Rats flourished in dozens of holes providing entrance to a rodent metropolis immediately adjacent to the school. They've crossed the fire lane and invaded 2-4-6 River Road in Manhattan Park where many residents with disabilities reside along with the Roosevelt Island Day Nursery. In spite of assurances from Beckman and the hopelessly compliant PTA, rats have been photographed on the school's playground, as shown above, and will soon enter the building, if they haven't already. Westview and the other nearby Manhattan Park buildings are bracing for an inevitable invasion from the expanding rat colony. For PS/IS 217 Principal Mandana Beckman, none of this raised as much concern as the loss of free parking spaces for herself and other school personnel. Also undisturbed were officials from School Commissioner Carmen Fariña's administration. led by Director Tim George, prodded by Kallos to come out Roosevelt Island after foot dragging for over a month. When George arrived, he convened a closed door meeting, officials only, while representatives from Manhattan Park, the Day Nursery and Public Safety were left to wait outside in the sun. George reportedly denied a Department of Health and Mental Hygiene request to make a thorough inspection. No reason was given. As for Kallos, who'd been quick to take credit for arranging the meeting, a subordinate from his office was dispatched in his place and did little more than attend. Protests came only from concerned residents. Another major failing committed by Kallos involved media coverage. Kallos informed me in a telephone conversation as well as Roosevelt Islander blog publisher Rick O'Conor that media would not be allowed to attend, a questionable restriction but one with which we had to live. Nonetheless, the Main Street WIRE's editor Briana Warsing was permitted to participate. Kallos's representative did not object. What makes Warsing's presence more concerning is her published coverage protecting Beckman, PS/IS 217 and the rats. Warsing's children attend the school, and the WIRE's Managing Editor Kelly Turner is a PTA executive officer. Far from showing concern for the children and our community, the WIRE and PTA have lined up behind Beckman and her rat colony. Earlier today, PTA President Eva Olavesen sent an email to RIOC, the Parents' Network and Briana Warsing at the Main Street WIRE, detailing a six to eight week plan - yes, six to eight weeks - to rid the school of the rats that have been so richly nurtured. By then, the colony should be well on its way into Westview, Island House and Manhattan Park. Olavesen excluded both Rick O'Conor and me from her update as well as Frank Farance without whose dedicated reporting on the issue, the school and its PTA would continue to do nothing. Now that rats have been spotted on the school playground and in Manhattan Park, parents, building managers and other residents are hopeful that more will be done to expedite the school's leisurely pace. Holding the principal and her DOE protectors responsible for the mess would make a good start.